The most significant architectural spaces in the world are now entirely empty of people. The data centres, telecommunications networks, distribution warehouses, unmanned ports and industrialised agriculture that define the very nature of who we are today are at the same time places we can never visit. Instead they are occupied by server stacks and hard drives, logistics bots and mobile shelving units, autonomous cranes and container ships, robot vacuum cleaners and internet-connected toasters, driverless tractors and taxis. This issue is an atlas of sites, architectures and infrastructures that are not built for us, but whose form, materiality and purpose is configured to anticipate the patterns of machine vision and habitation rather than our own. We are said to be living in a new geological epoch, the Anthropocene, in which humans are the dominant force shaping the planet. 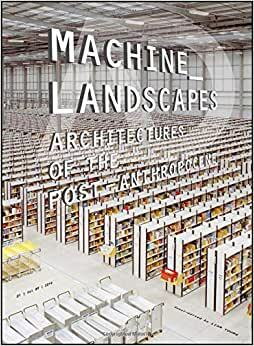 This collection of spaces, however, more accurately constitutes an era of the Post-Anthropocene, a period where it is technology and artificial intelligence that now computes, conditions and constructs our world. Marking the end of human-centred design, the issue turns its attention to the new typologies of the post-human, architecture without people and our endless expanse of Machine Landscapes. Contributors: Rem Koolhaas, Merve Bedir and Jason Hilgefort, Benjamin H Bratton, Ingrid Burrington, Ian Cheng, Cathryn Dwyre, Chris Perry, David Salomon and Kathy Velikov, John Gerrard, Alice Gorman, Adam Harvey, Jesse LeCavalier, Xingzhe Liu, Clare Lyster, Geoff Manaugh, Tim Maughan, Simone C Niquille, Jenny Odell, Trevor Paglen, Ben Roberts. Featured interviews: Deborah Harrison, designer of Microsoft’s Cortana; and Paul Inglis, designer of the urban landscapes of Blade Runner 2049. Liam Young is Fiction and Entertainment Coordinator of Design Studio at SCI-Arc, Los Angeles. An Australian-born architect, he is the founder of the think tank Tomorrows Thoughts Today, a group whose work explores the possibilities of fantastic, speculative and imaginary urbanisms. He co-runs Unknown Fields Division, a nomadic research studio that travels on expeditions to the ends of the earth, documenting emerging trends and uncovering the weak signals of possible futures. He has been featured in the mainstream and architectural media, including the BBC, NBC, Wired, Guardian, Time Magazine, and Dazed and Confused. His work has been acquired for the collections of the Metropolitan Museum of Art and the Victoria and Albert Museum. He has taught at the Architectural Association in London and Princeton University. He now runs an M.A. in Fiction and Entertainment at SCI-Arc.